A Top 50 box office documentary of all time, the Walker George film Young@Heart, originally broadcast on Channel 4 television in the UK, has since made its mark in the hearts of millions and been broadcast to the four corners of the globe. Screened in movie theaters around the world, it went on to win two Rose d’Or awards and the LA Film Festival Audience Award. It screened at Sundance and the SXSW Festival before it was released in the U.S. and Canada by Fox Searchlight in 2008. A crowd favorite, the film was later released in the UK, France, Belgium, Holland, Switzerland, Germany, New Zealand, Portugal, and Japan, winning the Audience Award at the Sydney Film Festival, the Paris Cinema International Film Festival, Ghent Film Festival, Atlanta Film Festival, Bergen International Film Festival, Warsaw Film Festival, among others. Lots of movies make me cry—it’s not that hard to do—but this moment cut so deep, it left me gasping for air. Fred Knittle performs "Fix You" by Coldplay in a scene from the film "Young@Heart" recorded live at the Academy of Music Theatre in Northampton, Massachusetts. In 2009, the film aired on PBS' Independent Lens. In the decade since its release, the film has aired on Netflix and been shown to thousands of young and old in senior centers, schools, universities, community and retirement centers around the world. 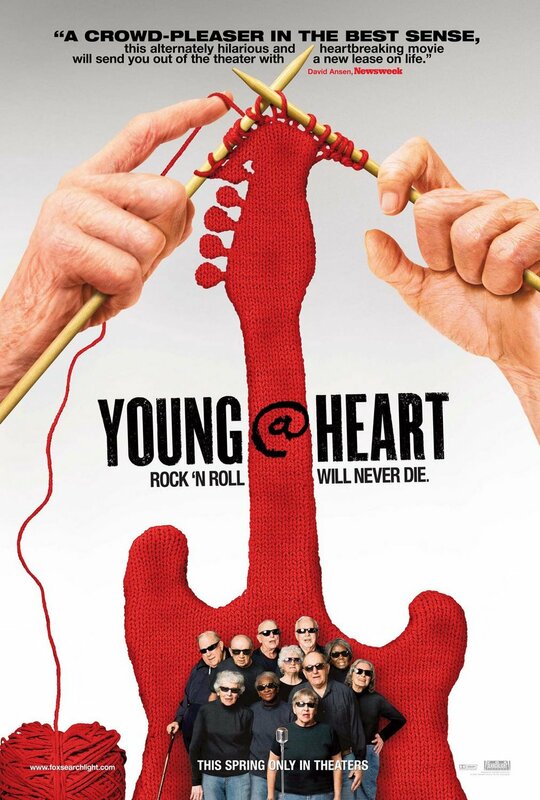 Rhino Records released a soundtrack to the film which contains 16 songs highlighted by Young@Heart's renditions of the Ramone's "I Wanna Be Sedated," Bruce Springsteen's "Dancin' In The Dark," David Bowie's "Golden Years," Sonic Youth's "Schizophrenia," James Brown's "I Got You (I Feel Good)" and Talking Head's "Road To Nowhere." Many of these songs are also featured on Y@H's 2008 album Mostly Live. Patsy Linderme sings "Nothing Compares 2 U" in memory and honor of fellow chorus member Joe Benoit shortly after learning about his death. The film is now available on DVD and can be purchased on our Merch page. Please contact us if you're interested in screening the film.